A slanted version of the events at Evergreen State College keeps driving the conservative news cycle—all while students suffer. Recent events at Evergreen, though, suggest a different narrative. 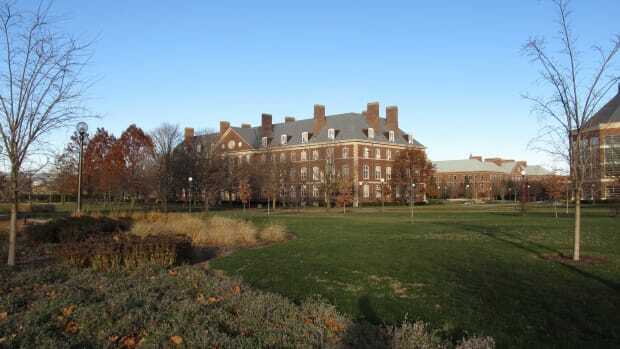 Weinstein&apos;s story is not one about out-of-control leftist students silencing professors. Rather, it&apos;s a story about how professors who align with right-wing media can shape university policy, while sidelining and demonizing students. "Free speech," wielded in bad faith by right-wing media, can turn into a gag to silence student protests and activism. 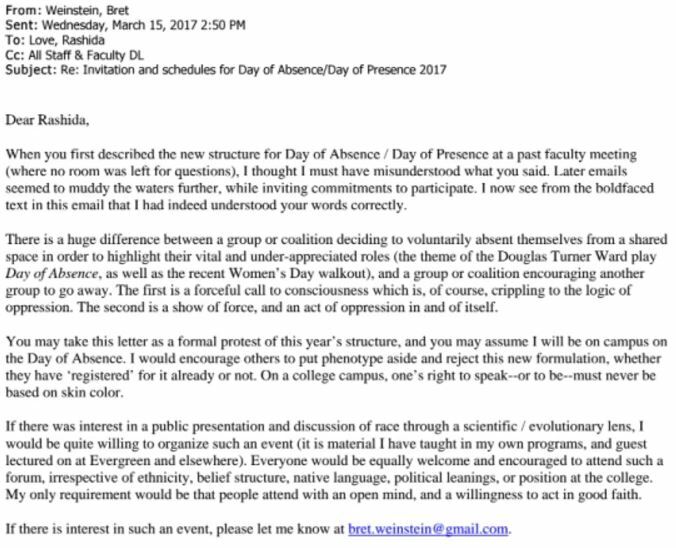 The original controversy at Evergreen involved the school&apos;s Day of Absence, an official event that has been held for decades. As part of the tradition, faculty and students of color would leave campus to illustrate their importance to the school and community. The next day, they return on a Day of Presence, when there are speakers and programming for the entire school. Last year, following the election of Donald Trump, Evergreen tweaked the event. Immigrants and undocumented people on campus were frightened by Trump&apos;s promises to step up deportations, so the school, following faculty and student input, decided to use the Day of Absence to re-affirm that "students belonged on campus and that there wasn&apos;t going to be any harassment or targeting of them on campus," says Jacqueline Littleton, an activist and a senior at Evergreen. To make that point, administrators switched the usual practice: Instead of people of color leaving campus, white people were asked to do so. This is where Weinstein came in. After the change in policy was announced, he sent an email in March of 2017, in which he said that the change in the day&apos;s structure was dangerous and immoral. "There is a huge difference between a group or coalition deciding to voluntarily absent themselves from a shared space in order to highlight their vital and under-appreciated roles ... and a group or coalition encouraging another group to go away. The first is a forceful call to consciousness, which is, of course, crippling to the logic of oppression. The second is a show of force, and an act of oppression in itself." The email was leaked in mid-April. During this march, Weinstein decided to come out of his classroom and confront the protesters. The protesters were well aware of Weinstein&apos;s email, and the conversation grew contentious. Students were especially angered when police arrived; they initially believed that Weinstein had called them himself. Since the students were protesting police bias, this was seen as an especially inflammatory move. The student protesters&apos; lists of demands after the cafeteria incident included zero tolerance for hate crimes, free health care for students, and a freeze on expansion of police facilities. Though the list initially included a request that Weinstein be fired, the student protesters removed it after a day, because, according to Littleton, "we were really trying to get away from the narrative that it was all about him or even mostly about him." Yet Weinstein continued to insist that the protesters were mainly concerned with his email. Though Weinstein calls himself a progressive, he went on the rabidly right-wing, anti-immigrant Tucker Carlson Tonight on Fox News shortly after the protests. 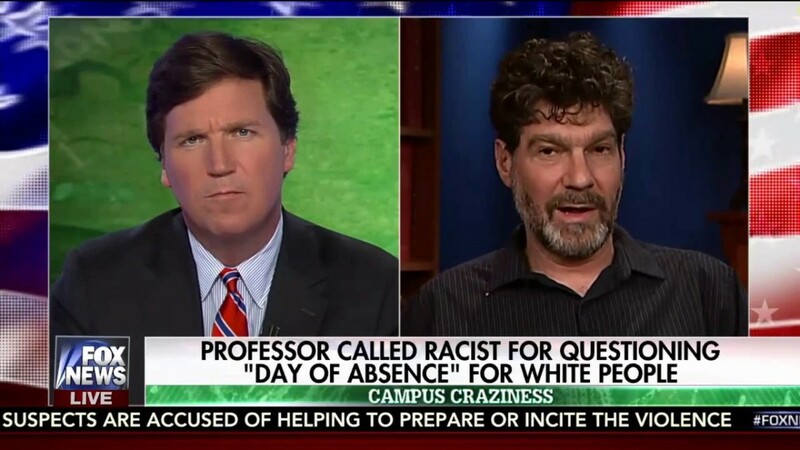 Carlson claimed that white people had been forced off campus, which was not true. He then played a clip of the protest, framing it to suggest, falsely, that the protest had been a response to Weinstein&apos;s email alone. Weinstein co-signed that version of events, and did not correct Carlson when he said that the core demand of the protesters was that white people leave campus—which, again, was completely false. Participation in the Day of Absence was voluntary, and student demands did not include any discussion of forcing students off campus. Weinstein&apos;s appearance on Carlson alerted the far right to the anti-racist protests at Evergreen, unleashing a flood of hate mail and a credible far-right terrorist threat that led to administrators evacuating the campus for three days in June. The school had to move the location of graduation. 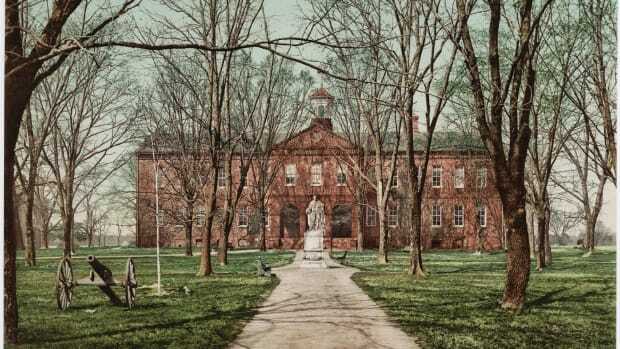 The Weinstein controversy has also had permanent effects on the college itself. 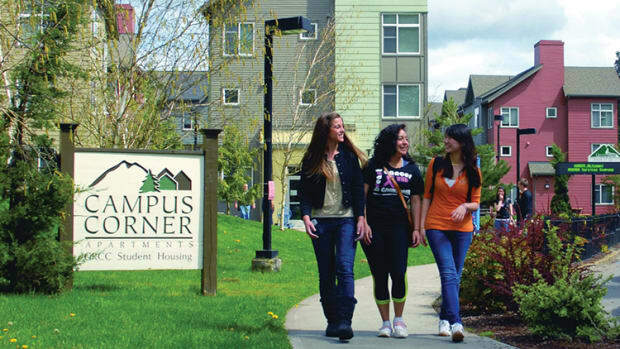 In 2018, Evergreen decided to cancel the Day of Absence. 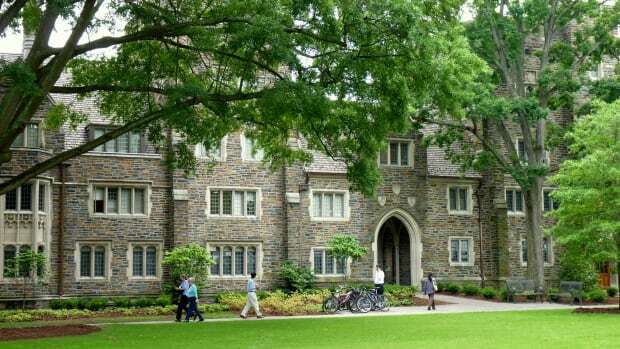 The official school statement says that the event was canceled because "Gross and deliberate mischaracterizations of the event in 2017 provoked violent threats against students, staff and faculty." In short, encouraged by Weinstein, right-wing hate-mongers were successful in their effort to shutter an anti-racist event, all under the banner of defending "free speech." Students at Evergreen, however, were not ready to let the tradition die, so, without school support, Littleton and others organized a three-day event. They returned to the original structure of the Day of Absence, whereby people of color left campus for a day. "The student of color population at Evergreen is pretty small," Littleton tells me, "so it can feel really isolating here sometimes, and this way we get to meet other people of color and maybe talk about our shared experiences at Evergreen. And a lot of white people who have taken part in the Day of Absence have also really liked it. We had a lot of white people involved in the planning of this year&apos;s Day of Absence, and they did a lot of the work in helping make this happen." Some online trolls even threatened to show up at Evergreen itself. Zoé Samudzi, a speaker at the 2018 Day of Absence and co-author of the forthcoming book As Black as Resistance: Finding the Conditions for Liberation, was contacted by the Carlson show; the producer asked her questions about whether she really wanted to be associated with such an event, apparently trying to provoke a controversial response. In the end, the 2018 Day of Absence proceeded without any violence or confrontation on campus. Samudzi tells me she gave a well-received talk to an engaged audience that, like the student body at Evergreen, was mostly white. "I think that there&apos;s a particular cowardice in the university not sponsoring the Day of Absence," Samudzi says. "I think that we&apos;re seeing how a lot of university administration, regardless of how liberal they&apos;re purporting to be, really capitulate to the social and political pressure that&apos;s put on them by the far right. I think that that&apos;s really the big threat to academic free speech." Right-wing media personalities like to present left-wing students—especially black left-wing students—as dangerous totalitarians, threatening democracy. But the truth is that students have limited power, and limited ability to make themselves heard. Right-wing media has been eager to amplify Weinstein. In contrast, students at Evergreen have struggled to get their stories out. Weinstein left Evergreen with a generous pay-off, and now has a successful Patreon and enjoys flattering coverage in the New York Times. Students on campus, meanwhile, lost anti-racist programming, and faced far right harassment, without any tangible recompense. Despite threats and administrative hostility, these students refused to let the Day of Absence die. 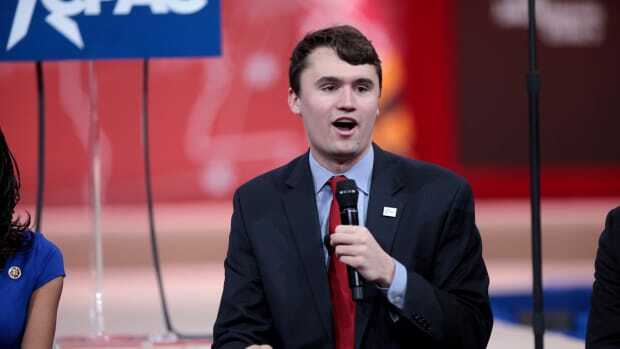 Still, that shouldn&apos;t obscure the way that Carlson, Weinstein, and others misrepresented the nature of the event, encouraged harassment, and stirred up protest in a nearly successful effort to suppress anti-racism on campus. That seems a whole lot like a curtailment of free speech—unless, of course, you have convinced yourself that students don&apos;t have anything to say. *Update—June 15th, 2018: This article has been updated to reflect the full name of Evergreen State College. *Update—July 10th, 2018: This article has been updated to reflect the ethnicities of the students who were not detained following the cafeteria incident, that Weinstein sent one tweet (not several) accusing the students in the photograph of being involved in violence, and the number of Twitter followers that Weinstein had at the time of the tweet in question. American conservatives keep attacking left-wing academics for what the right wing is actually doing.